Ball kid or towel dummy? I cannot clearly remember when it started. You know the signal to the ball kid, usually a hand wiping the face and then the ball kid dutifully appearing with the towel and then waiting while the player towels down and then catching the now sweaty towel as the player tosses it away. In my mind I imagine it was probably during a brutal five set match at the U.S. Open on a sweltering August day with the humidex reaching into the 40 centrigade degree range or the 110 Fahrenheit range. The kind of day that caused profuse sweating resulting in drops of sweat producing a burning sensation as they rolled into the players eyes. I wonder which player it was that brought the towel from his chair and stashed it at the back of the court within easy reach for a quick wipe between points. I bet that player had no idea what he/she was starting. Sometime between that day and today the towel wipe has become an integral part of each match and in some cases an integral part of each point. It did not take long until players figured out a towel wipe was a great stall technique giving them a few added precious seconds between gruelling points. Pretty soon every player was storing a towel at the back of court and players were toweling off between every point even if that point consisted of a single stroke a cool day. The ATP trying to speed up the game instituted the 25 second rule which requires the server to begin his service motion within 25 seconds of the end of the previous point. Instead of giving up on the towel wipe the players began to require that the towel be brought to them. And so the ball kids acquired a new job. Towel delivery. After the towel wipe the player often just tosses the towel in the direction of the ball kid without even making eye contact. The ball kid is expected to dutifully pick up the towel and store it out of sight until the next point. I personally think it is disgusting and degrading that the ball kids have to handle the sweaty towels. My solution. Have a stand placed at the back of the court for the towel. The stand could be sponsored by a prominent towel company or a store like Bed Bath and Beyond. The player can get the towel when he/she needs it and place it back on the stand when done. All on their own and within the 25 sec time limit. I tried to think of any other sport that provides towel service and I cannot come up with one. It’s time to take the onus of towel service off the ball kids and put it back on the players. Serena Williams capped off the 2014 Grand Slam season by winning the US Open for her 18th major title. To quote Serena after the match “It means a lot to me, who could ever imagine I’d be mentioned with Chris Evert and Martina Navratilova. I was just a kid from Compton with a dream and a racket.” And yet there she was on the court receiving an 18 carat gold bracelet in honour of her achievement from Chris and Martina. So now what? Well already Serena has begun talking about Grand Slam Title #19, but knowing the competitor that she is, i believe she is taking aim at Steffi Graff’s record of 22 titles and planning her path to #23. If this is this case, i think there are a few things that should be considered. 2014 was hardly a banner year by Serena standards, especially since she usually judges her year by her results at Grand Slam tournaments. At the Australian Open Serena lost in the fourth round to Ana Ivanovic, although she did confess she was dealing with a back injury. In Paris, at Roland Garros, Serena was stunned in the second round by the up and coming Garbine Muguruza of Spain, and that was quickly followed by a third round loss to Alize Cornet of France on the grass courts of Wimbledon. I am not even going to delve into the doubles fiasco that was the Williams Sisters exit from Wimbledon. In contrast, Serena’s results at the less significant tournaments were much more impressive. Serena won the title in Brisbane, prior to the Australian Open, defeating Victoria Azarenka and followed that with a win in Miami at the Sony Open with a victory over Li Na. Prior to Roland Garros Serena won the Internazionali BNL d’Italia. On the hard courts of the US Open Series Tournaments, Serena won the Bank of the West Classic in Stanford and the Western and Southern Open in Cincinnati putting her out in front in the race to the US Open. But, to pass Steffi Graff and win 23 Grand Slam titles, Serena will have to win 5 more Grand Slam tournaments. Each tournament requires 7 consecutive victories to claim the title which means Serena will have to win 35 more matches at the biggest tournaments. This means Serena will have to be focussed from the very start of the tournament even in those early round matches where she often has trouble staying in the moment. Reports in the last week, have indicated that Serena has parted ways with her coach and sometime boyfriend, Patrick Mouratoglou. In my opinion if Serena is to take a run at the all time Grand Slam Title record, now is the time to put a champion in her camp. 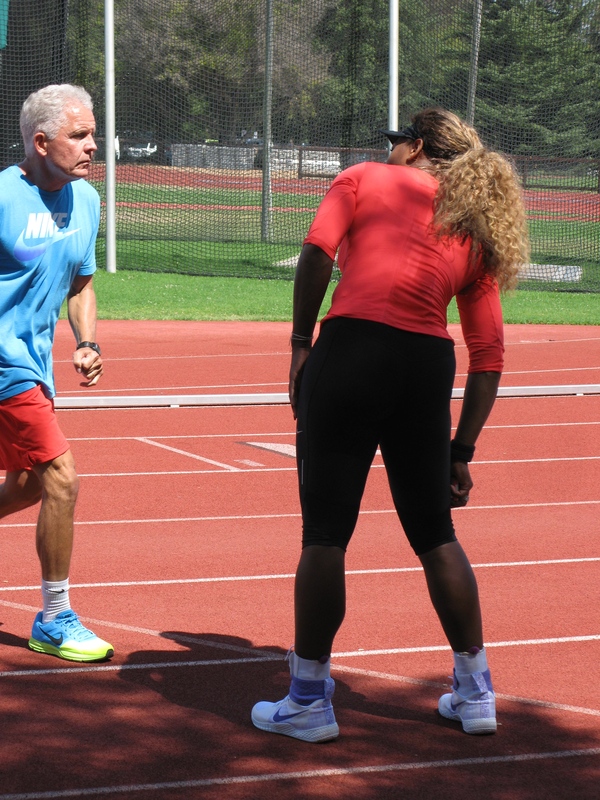 Serena does not need a coach to help her with her groundstrokes or her volleys and certainly her serve is the best in the women’s game, Serena needs a coach in her box who has the winning mentality. And there were two of the best standing with her at the US Open trophy presentation, Martina and Chris. What a perfect opportunity to glean a winning mentality from either of those two champions while at the same time promoting the ability of women to coach at the highest level of the game. Although the record is within her reach, the draw of so many outside activities could be an issue. Her show at New York’s Fashion week made headlines, as did her absence at various media events following the championship win. If Serena is not enjoying the work required to win those championships the results will not be there. In fact one of the things that Marin Cilic the US Open Men’s champion said was that his new coach Goran Invanisevic put the fun back in the game. 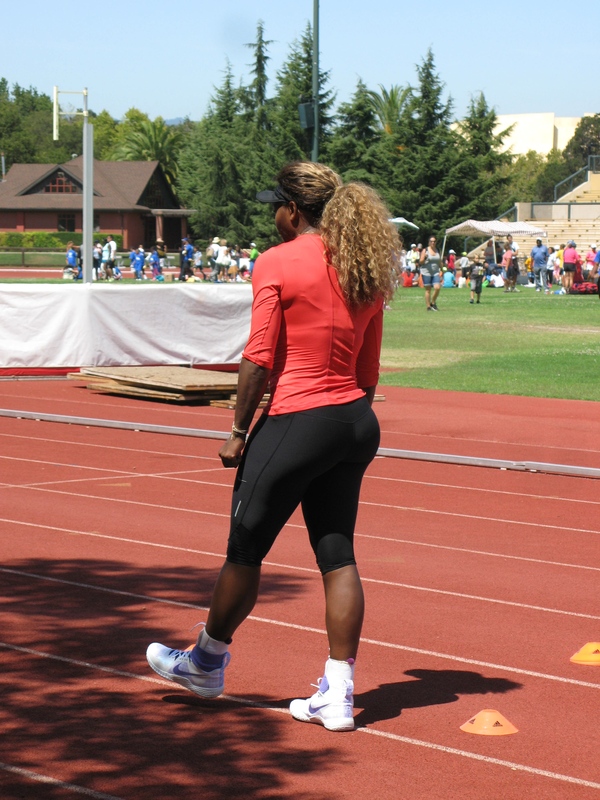 As i watched Serena warm up for her match in Stanford (see photos) i couldn’t help but notice how miserable she seemed. While other players tossed frisbees to warm up and appeared loose and relaxed, Serena appeared disinterested and bored. My prediction: I expect Serena to keep competing and going after the record as long as injuries do not become an issue and she can keep her eye on the prize.